It's not that I can't wedge a slice of pizza into Kenya's LapTop Lunch Box, it's just that it can be a bit of a challenge. When kids open their school lunch, the first thing they'll likely judge their food on is it's appearance, so a piece of pizza that's been smashed to fit in the box, doesn't seem like the easiest sell -- no matter how much they love it. That was part of the reason that I came up with these Pizza Pinwheels. If you tune in to weelicious enough, you know that we make a lot of pizza in our house and coming up with new recipes for how to present it besides the everyday slice with tomato and cheese is part of the fun for me. 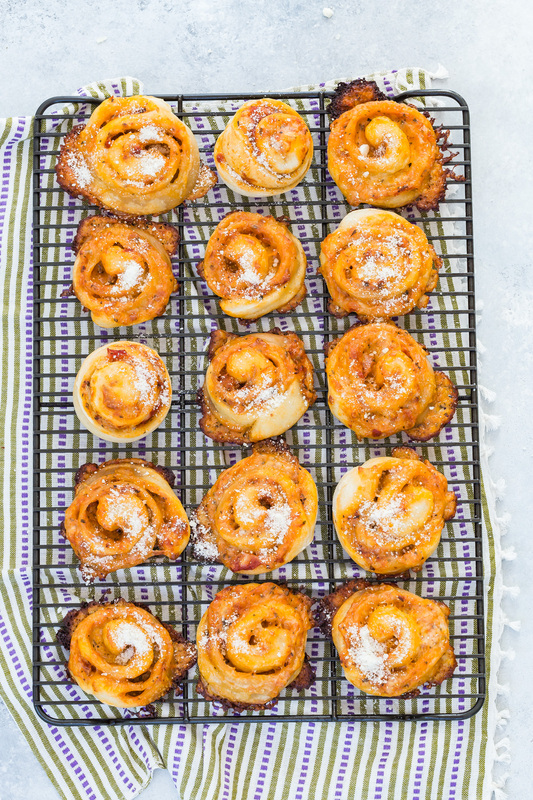 These pinwheels are really like a pizza "sandwich" because the filling is savory, kind of like a ham and cheese sandwich, but much cooler looking. They almost dare you not to eat them. It's also a versatile recipe in that you can substitute your fillings to fit your mood. 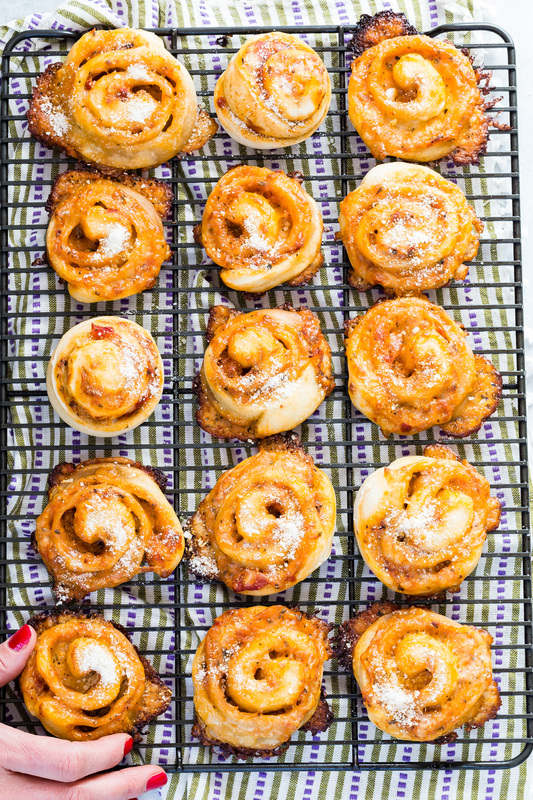 Whether you decide to replace the ham with turkey or chicken or even go with just traditional red sauce and cheese, these Pizza Pinwheels will have your kids coming home from school asking for more! 2. Roll out pizza dough until 1/4 inch thick and the shape of a large rectangle (about 18 x 12 inches). 3. Evenly spread the mustard on the dough, and sprinkle the ham and cheese on top. 4. Starting with end nearest you (the long end of the rectangle), roll the dough away from you, creating an even cylinder as you go (similar to a jelly roll). 5. Lightly sprinkle some flour on top of the roll (so it’s easier to cut) and using a serrated knife, cut the roll into 1 inch discs (pinwheels). 6. Place pinwheels on a parchment or silpat lined baking sheet and lightly press them with the palm of your hand to slightly flatten and bake for 12-15 minutes. To Freeze: After rolling up the dough, cut the roll in half and freeze for later. When you are ready just take it out and let it thaw to room temperature then cut them into pinwheels and follow the steps 7-8. Or you can just cut the entire roll in pinwheels and place some pinwheels on a baking sheet, freeze for 30 minutes then place them in a ziploc bag, label and freeze. But be sure to always let the pinwheels come to room temperature then bake. brilliant...can't wait to try this for my 17 month old who hasn't mastered feeding herself with utensils without making a huge mess. she is super independent though, so these will be perfect! thanks!! Love.it. On the menu for later this week. You rock! I just followed this recipe to the letter and it all burnt. Every last one. I used parchment paper, and even that started to brown. 450 for 12 minutes is WAY too high. I cooked the last 4 pieces that didn't fit on the cookie sheets in the first batch at 425 for 10 minutes and that was perfect. So sorry to hear that, every oven is different. Did you buy pre-made dough? I buy the ones from Trader Jo's and on the instructions it says to cook them at 450. Also your oven temp setting could be high. Or even the altitude can affect it. I hope you try them again at 425. Let me know! Yes! After rolling up the dough, cut the roll in half and freeze for later. When you are ready just take it out and let it thaw to room temperature then cut them into pinwheels and follow the steps on cooking. :) Or you can just cut the entire roll in pinwheels and place some pinwheels on a baking sheet, freeze for 30 minutes then place them in a ziploc bag, label and freeze. But be sure to always let the pinwheels come to room temperature then bake. This is a great snack! I have the weelicious whole wheat pizza dough frozen. Do I let come to room temp, then prepare or cook for 400 on 7 min and then...? This was a big hit with the whole family, thanks! Any tips on working with the TJ's dough? Had trouble rolling it out to the large rectangle without holes. Will definitely be making this one over and over! Did you let it come to room temperature first? If you roll it out too thin, you will get holes. I used TJ wheat dough and cooked at 450 for just over 12 mins and they turned out great. I can't wait to make there for a party. sheryl, you just did and they were awesome and it's what brought me to this page. btw... what was the other option you made? desmond ate the ham mustard. I baked them for a picnic lunch for a change instead of sandwiches. They were a huge hit, especially with the kids. They are fab cold too! Instead of mustard could you use pizza sauce and make it more like real pizza? Is there a reason you choose mustard instead? Can you make this ahead, refrigerate it and pop it in the oven later? I don't have much time at dinnertime, so I'd love to be able to make this in the morning, let it sit in the fridge all day, and take it out at dinnertime and pop it in the oven. Or do I still have to wait for it to reach room temp? Made these for lunch today, yummy! I love that I could freeze half for later, great time saver. Thanks! do these stay ok after being in a lunch box for a few hours? not chewy? They don't get chewy. They are pretty close to the consistency of leftover pizza! Do you bake these in the morning before making a school lunch (and put them in fresh) or the night before? I usually bake them for dinner and then they get one or two in the next day's lunch! My kids loved these in their lunches (I used pizza sauce instead of mustard)! Just wondering if you can make these the night before and then serve them in the late morning. Trying to plan easy birthday meals. how would you make this without pizza dough? Could you use tortillas? Or thin rolled out bred? Hmmm I think the tortillas would work! I always pack an ice pack with lunch just to be extra certain everything is kept at a safe temperature! With hot foods, I let them cool completely on the counter before placing in the fridge or in the lunch box. I usually pack lunch at night after dinner so the entire lunch stays in the fridge all night. hello,after you bake them do you keep them in the fridge overnight? For the next day lunch?